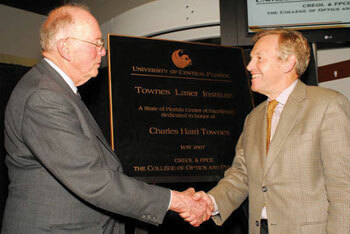 The Townes Laser Institute was dedicated as a new laser technology Center of Excellence within the University of Central Florida’s College of Optics and Photonics in Orlando on May 4 in honor of Charles Hard Townes. Credited with inventions that led to the development of the laser, Townes won the Nobel Prize in physics in 1964. A ceremony was held at the university’s Center for Research and Education in Optics and Lasers (CREOL) facility. Townes also received an honorary degree from the university and gave the commencement address the following day. On May 4, the Townes Laser Institute at CREOL was dedicated in honor of Charles H. Townes, pictured on the left. Martin Richardson, on the right, is the institute's principal investigator. The Townes Laser Institute is funded in part by a $4.5 million grant from the state of Florida to the college’s Florida Photonics Center of Excellence. 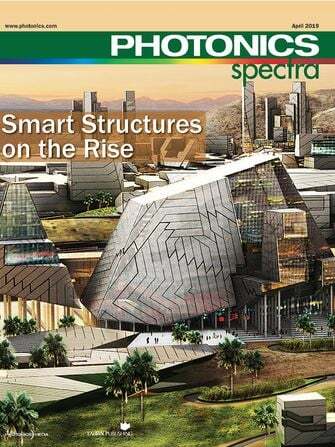 Its mission is to make the university a premier center of advanced laser technology. In addition, the university will hire six new faculty members and will contribute more than $3 million for equipment and start-up costs that will enable the institute to develop laser technologies for medicine, for defense and for advanced manufacturing tools.